This report evaluates what the Paris Agreement on climate change means for the “Big Five” oil sands producers—Canadian Natural Resources Limited (CNRL), Suncor Energy, Cenovus Energy, Imperial Oil, and Husky Energy—by estimating the social cost of carbon (SCC) of the oil and gas reserves of these firms and by assessing the emissions-reduction disclosures and targets, climate change-related policies, and material actions of the Big Five. Calculating the SCC or carbon liabilities of oil and gas firms is a method that economists use to estimate the social and economic damages from emitting a tonne of carbon and, conversely, the benefit of reducing carbon emissions. The report calculates the carbon liabilities of the Big Five’s proved and probable oil and gas reserves based on three SCC estimates: the low estimate of $50 per tonne was used in previous economic research and is applied to the proved reserves only, while the middle and high estimates of $100 and $200 per tonne are used by the United Nations Global Compact and in previous economic studies respectively and are applied to both the proved and probable reserves. The carbon liability estimates for the Big Five lead to a striking conclusion: even using the low estimate, the carbon liabilities of each firm far outweigh their total assets and market capitalization. When the low SCC estimates for the Big Five are added together, these carbon liabilities outweigh not only the value of these corporations, but also the Alberta economy as a whole; the lowest estimate of the total carbon liabilities of the Big Five ($320 billion) is substantially higher than Alberta’s total gross domestic product ($309 billion). All of the Big Five except for Imperial Oil acknowledge the Paris Agreement, yet none of these companies have made science-based targets that align with the amount of decarbonization required to keep the global average temperature increase below 2°C. The Big Five need to start publicly disclosing their emissions modelling for the sake of transparency and accountability. As with their reduction targets, none of the Big Five have implemented material actions that are in line with decarbonization required to meet the 2°C limit. The Big Five’s hopes for future emissions decreases rely primarily on claims that new technologies will enable substantial reductions. However, technological advancements to date have not produced absolute emissions reductions, and there is no reason to believe they will. The only realistic way for the Big Five to reduce their total emissions is to reduce their oil and gas production. 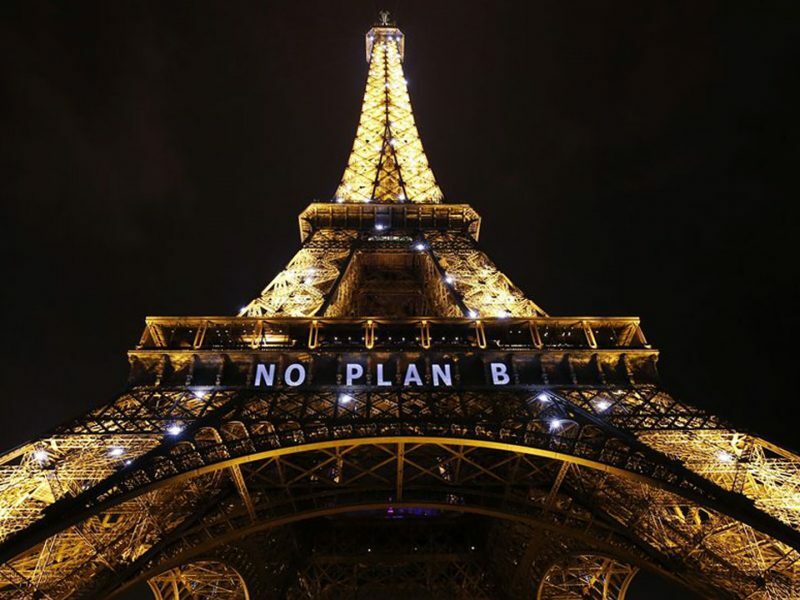 The Paris Agreement means that business as usual for the Big Five and other fossil fuel producers is not an option. 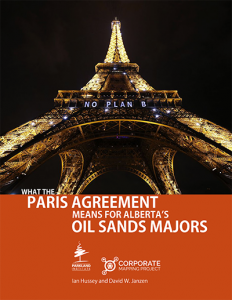 What the Paris Agreement Means for Alberta’s Oil Sands Majors is part of the Corporate Mapping Project, a research and public engagement initiative investigating the power of the fossil fuel industry in Western Canada. The CMP is jointly led by the University of Victoria, the Canadian Centre for Policy Alternatives, and Parkland Institute. This research was supported by the Social Science and Humanities Research Council of Canada (SSHRC). David W. Janzen is a recent PhD graduate of the University of Alberta. David’s interdisciplinary critical research examines conceptions of crisis, globalization, and environment. He has recent and forthcoming publications on Mayan anti-mining movements, political economy of crisis, and literature, as well as more experimental work on rhythmanalysis, sound, and ecology.